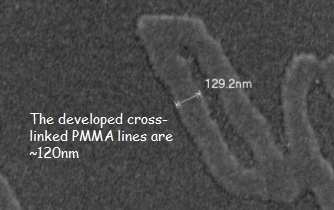 While the PhD thesis research of Jian Wang [1,2] showed that tunable synchrotron light in a STXM can generate chemically selective patterns inmulti-layer polymer structures, the spatial resolution achieved was 150 nm or worse, due to radiation damage spreading mechanism. However, if patterns are generated in PMMA by STXM and then chemically developed, much higher spatial resolution caan be achieved. Fig. 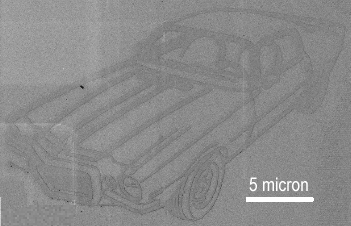 1 shows a cartoon of a 1972 Camaro written in PMMA on a 20x40 micron template, chemically developed and imaged with SEM. Features are sharp at the spatial resolution of the STXM (30 nm), as shown in Fig 2. Since then a further signifcant improvement in spatial resolution has been achieved.